This happened to a student who did not pay enough attention which programming header to use (I admit: it could have happened to me too). So how to recover the bootloader on that board? I checked the Freescale Freedom board pages, but there is no bootloader binary or project to download :-(. But I had another board: why not copy that firmware to recover the firmware on the other board? 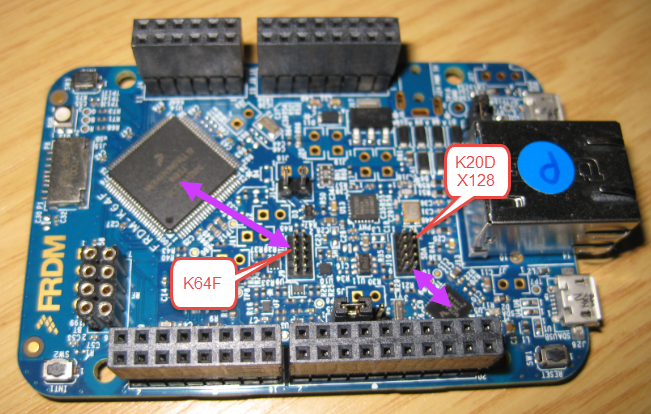 💡 If you do not have a second board with a good firmware on it: don’t worry and read the summary at the end. 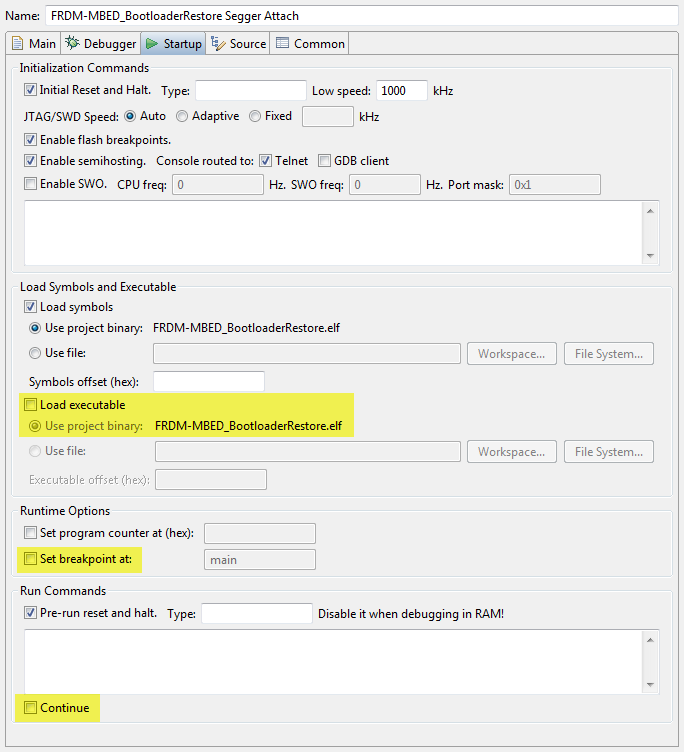 I’m using here a Segger J-Link with Kinetis Design Studio, but same steps should be applicable for other debug connections or IDE too, with the same principle. ❗ The steps here work only for the new OpenSDA v2 boards (e.g. FRDM-K64F), and not for the previous ones (e.g. FRDM-KL25Z). This project allows me to write normal applications for the K20, and I can use to copy and past firmware files between boards. The other settings (breakpoint setting, continue) are more optional. ❗ There is a known issue with the Segger connection that somehow a true ‘attach’ to the target is not working (attaching means that the target keeps running as normal). What happens is that after connection, the Segger J-Link will reset the target, even with ‘Pre-run reset and halt’ disabled. I have found a solution for this, but it does not matter in this use case. With this ‘attach’ configuration, I ‘debug’ now the K20 of my working board. For the bootloader, only the first 16KByte (or better 64 KByte) would be necessary, but I’m free to dump the memory. If I dump the full memory, then I have not only the bootloader, but as well the application loaded on the K20. Exporting the memory will take a few seconds to complete. Then terminate the debug session. Now I have an image copy of what is on the working K20. In the next step I’m going to program it on my broken board. The bootloader on the new FRDM boards (FRDM-K64F, FRDM-K22F) is not protected which is a good thing. But in case the bootloader is corrupted, I need a way to restore it. One way I have shown in this article is to clone and copy the bootloader (and the application, if you want) from an existing board. That method is of course handy as well if you want to program multiple boards with the same S-Record file too. Or if you want to make a backup of a firmware on a board. 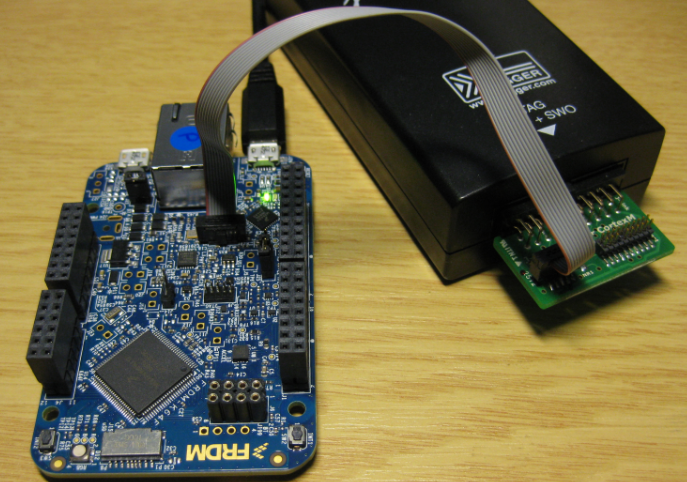 This entry was posted in ARM, Boards, CPU's, Debugging, Eclipse, Embedded, FRDM-K64F120M, Freescale, Kinetis, mbed, Tips & Tricks and tagged Debugging, Eclipse, Flashing, freedom board, Freescale, OpenSDA, technology, Tips&Tricks by Erich Styger. Bookmark the permalink. Erich, Where did you get the JLINK cable adapter for the tiny JTAG connector on the Freedom? Do you have some demo about how to use USB Generic HID ? my MCU is K20D70. No, I don’t have this (yet). 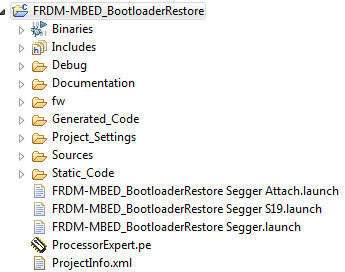 Can you try the bootloader s19 file located here? 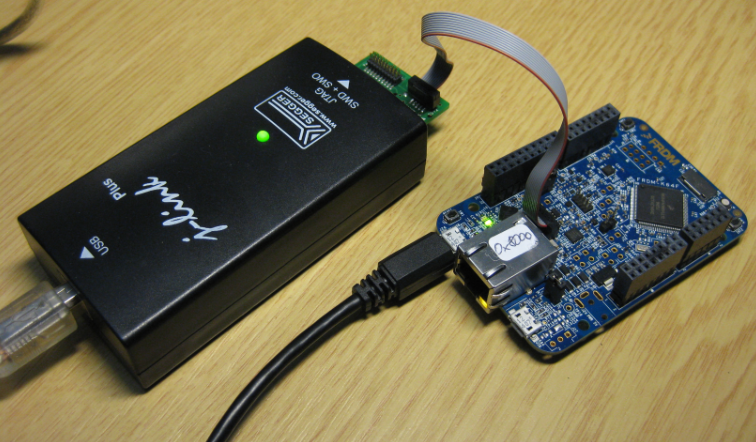 Should this process also work with the J-Link EDU (8.08.90) + 9-pin Cortex-M Adapter (8.06.02)? We don’t currently have a J-Link debugger, and would purchase one only for the need of recovering corrupted K64F boards. The J-Link EDU does not include J-Flash, and I’m not certain if it is required. yes, this works with any Segger J-Link, including the EDU version which I have used for this kind of things too. I’m starter of mbed. And I appreciate of your blog. BTW I trying to recover my mbed board. But my eclipse setting is so far from yours. 1. How can I setting my eclipse enviroment? 2. When I create project, it is just empty. How can I make empty archieve as you did? 1) You need an Eclipse with an ARM toolchain, e.g. 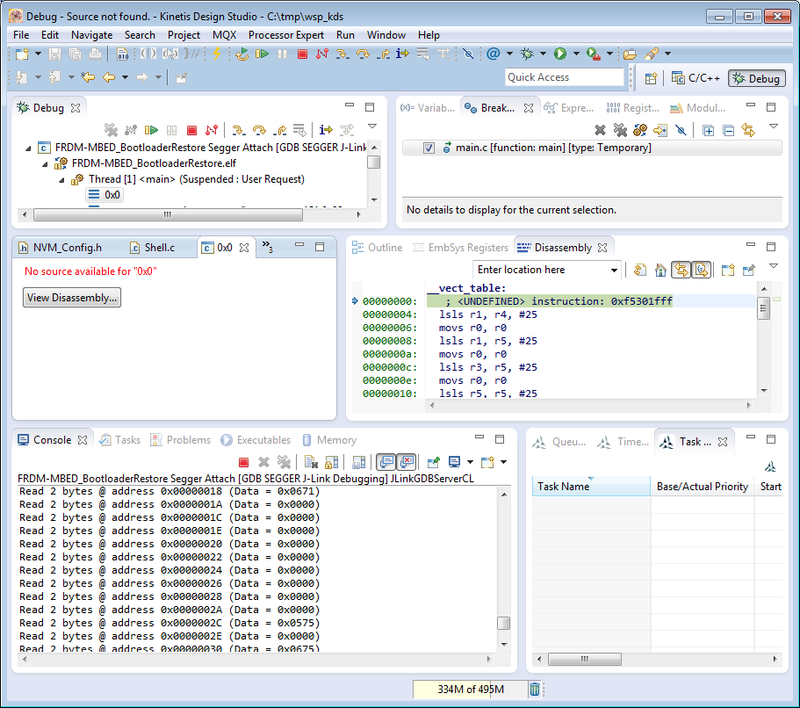 use Kinetis Design Studio (http://www.nxp.com/kds) or the MCUXpresso IDE. 2) You don’t need an empty archive. All what you need is a project with the toolchain (especially debugger) setup. You can get this easily say with Kinetis Design Studio. I try to copy FRDM-KL43Z. But I got erro message. I use [J-Lind edu] and KDS verersin 3.2.0. I connected through JTAG. did you connect to the OpenSDA or to the J11 header? Keep in minid that you cannot use JTAG, you have to use SWD. And if you connected to J11, then I would say you have plugged in the cable the wrong way, so it does not sense the 3.3V. 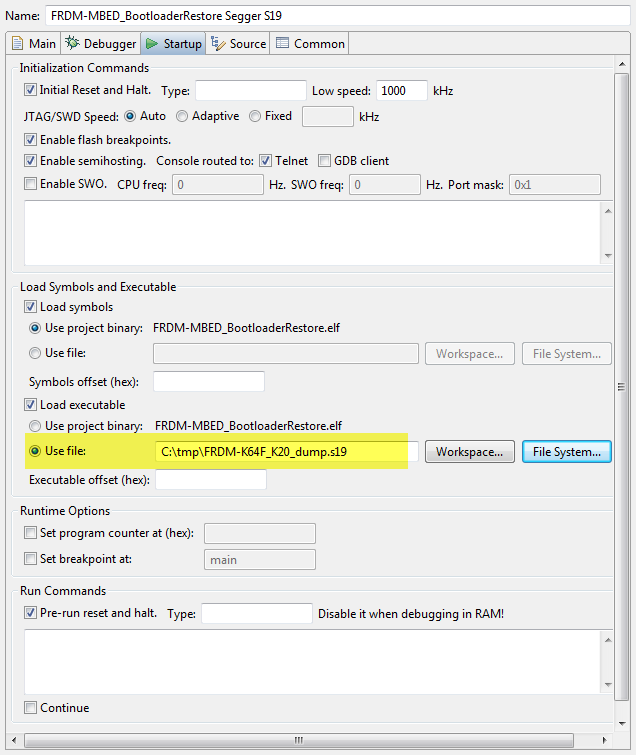 For the header/pin layout see https://mcuoneclipse.com/2012/11/07/jtagswd-debugging-with-the-frdm-kl25z-board/ (it is the same for the FRDM-KL43Z). Thanks!! I used JTAG first, I cannot download it. I have one more question. I think I bother you a lot. Sorry about that first. BTW, I extrated bootloader from FRDM-KL43Z board. (.s19 file) And I try to install broken board. I imported dump file and some hex code was changed to red. But when I click the resume button all changed bits are setted 0. These symtoms happen when I flash the bootloader on my broken board. Is there way to fix the code after I import bootloader? 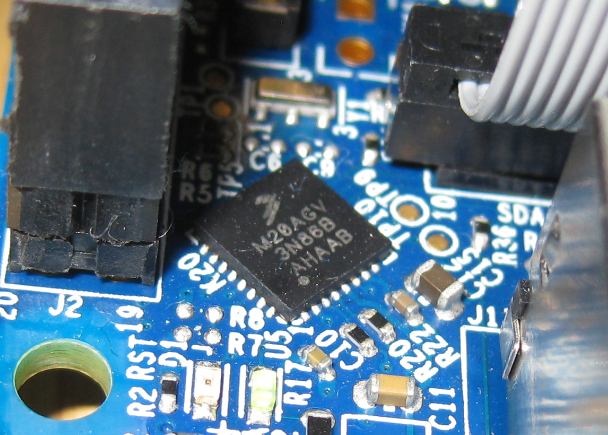 The bootloader on the OpenSDA/K20 V1.x of the FRDM-KL43Z board is closed and secured by the flash protection. You cannot change the V1.x bootloader. You only can change the V2.x bootloader as it is present on the FRDM-K64F. Can i dump memory of mc9s08sh4? using usbdm? Is there any licensing issues with cloning the bootloader circuit from K64 to a new board design including firmware? I meant to say: Is there any licensing issues with cloning the bootloader circuit from FRDM-K64F to a new board design including firmware? The OpenSDA circuit is ‘open’ so you can integrate it into your own design (altough I did not see any specific licensing clause for the schematics/circuits?). The firmware is a different topic: the bootloader is open under the mbed license (see https://mcuoneclipse.com/2017/10/29/adding-a-delay-to-the-arm-daplink-bootloader/ and https://github.com/ARMmbed/DAPLink. The CMSIS-DAP firmware is open too, but the P&E and Segger OpenSDA firmware are closed. 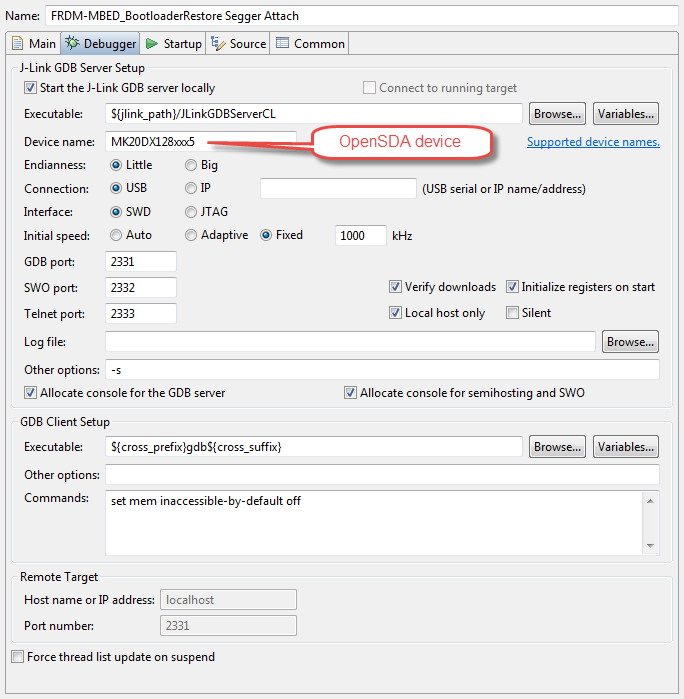 Especially the Segger firmware calls out that it cannot be used for custom boards (see https://mcuoneclipse.com/2013/05/16/freedom-board-with-segger-opensda-debug-firmware/).